Despite all the negative things we read about cycling in Malta prior to our trip, from poor driving habits to inadequate roads, riding around the island has been a fantastic experience. With an area of 246 km2, a shoreline of 137 km and a maximum distance from one extremity to the other of just 27.3 km, I believe that cycling is in fact the ideal way to discover the island. Some of the rural roads were in need of maintenance, scattered with potholes and liable to flooding within minutes of any rain. However, even the minor roads were very wide and we had no issues with any drivers. The quality of driving and attitude to cyclists was certainly no worse than in the UK. We were a little bit unlucky with the amount of rain during our trip but, with average highs of 30 degrees over the summer, autumn and spring are definitely the best times of year to cycle in Malta. The latter tends to see less rainfall, so if I were to repeat the trip I may opt for March or April instead. I believe that Malta has the potential to grow as a biking destination over the next few years. In the meantime, here is some guidance to help you plan your own cycle trip in Malta. 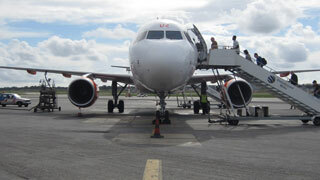 EasyJet operate from London Gatwick to Malta, with fares starting at around £100. Air Malta is the national Maltese airline and fly to London Heathrow. Ryanair fly from London Luton and London Stansted to Malta. There is only one international airport in Malta, which is connected to all parts of the island by multiple bus routes. We rented our bikes through Malta by Bike and, although we only booked the bicycles a week before our trip, the service we received was faultless and very reasonably priced. We paid €28 each for a three day rental (with a €25 deposit on top). The bikes were supplied with helmets (although we had brought our own), lights, locks and a repair kit. Malta by Bike are happy to deliver and collect the bicycles anywhere on the island, at no extra cost. Our man Sergio even offered to meet us anywhere at any time should we get in to difficulty during the rental. Due to the rugged terrain and bumpy roads, I highly recommend using mountain bikes. 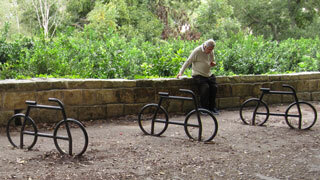 Other bike rental companies also operate in Malta, including EcoBikesMalta and Malta Bookers. All three companies also offer cycling tours (although not of the whole island). At busy periods, it would be wise to book your bikes well in advance to avoid disappointment. Of course, you could take your own bike instead. But with such low rental charges, it would almost certainly be more expensive to book your bike on to a flight than to rent locally. There are not many designated cycle routes in Malta, nor did I find any documentation online suggesting that anyone had cycled around the island previously. We were very much left to our own devices in planning the route and used a combination of Google Maps and a laminated travel map. Several websites showed short routes around various parts of the island, but none offered a full tour of the island. However, I was able to cross-reference these shorter routes to identify roads that would be most suitable for cycling along. I also found a feasibility study in to the implementation of cycle routes in Malta created by a Danish ecological consultancy company. This document includes maps showing the existing cycle tracks and minor roads. I was able to enlarge these and print them off to further refine our route. Despite taking the official map, copies of the highlighted feasibility study maps and sections of the Google maps zoomed to various levels, we still got lost on a number of occasions. The biggest difficulty was in sticking close to the coast without getting stuck on cul-de-sacs. The minor rural roads are particularly hard to navigate, with many branches where it's not clear which way the main route goes, and no sign posting either. Our main difficulty was on the stretch from Rabat to Golden Bay, where we opted to use more major roads, despite the increased traffic. We booked all our accommodation through Booking.com. 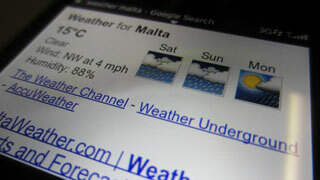 The official Visit Malta website also includes a section on hotels and guesthouses. Of the various places we stayed, I especially recommend Maple Farm, which is well-located to explore the western half of the island and very near to the Dingli Cliffs. If you are planning to complete the tour of the island in just two or three days, your route and overnight stops will be dictated by your flight times. Don't be afraid to cycle straight from or to the airport, if you are able to arrange bike hire accordingly. 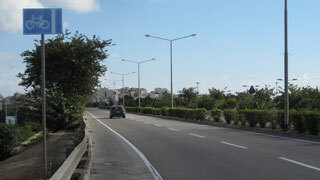 The main road past the airport does incorporate cycle lanes. The size of the island makes it easy to overestimate distances when looking at a map. On several occasions, we were startled to arrive somewhere so soon, for example when we crossed from Golden Bay, on the south coast, to St. Paul's Bay, on the north, in just 15 minutes. From the airport, I suggest heading south and then west to tour the island clockwise, as we did. If you are going to go anti-clockwise, head north towards Valletta and then west. The area directly east of the airport is quite industrial and is not so appealing to cycle around. Most of the hotels are located along the northern coast of Malta, which is far more developed than its southern counterpart. Plan carefully to cover reasonable distances without getting stranded in the countryside. 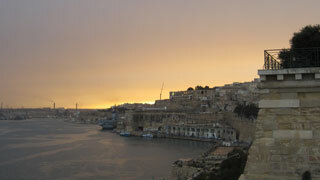 If you have the time (at least three full days), take a ferry over to Malta's second-largest island, Gozo. This peaceful island is 15 km long and has a shoreline measuring 45 km. A regular shuttle ferry operates between Cirkewwa on the island of Malta and Mgarr, on Gozo. The crossing takes about twentry minutes and the standard passenger fare stands at €4.65, with a €1.15 supplement for bicycles (correct in November 2012). 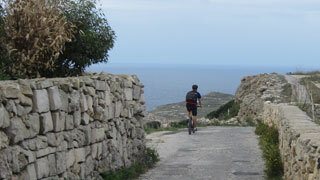 If you have a full extra day available, why not cycle all around Gozo as well? The island is very scenic, and more hilly than the main island. 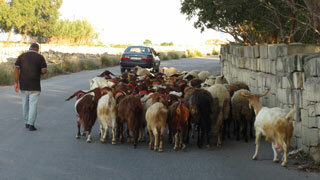 There are plenty of hotels on Gozo. One of the key events in the Maltese cultural calendar is the annual carnival that takes place from the Friday up until the Tuesday preceding Ash Wednesday. On the final day, a procession makes its way along the main street of Floriana and is followed by a fireworks display. The dates of the carnival may make it an appealing time to cycle around Malta and, with festivities taking place in villages throughout the islands, it is sure to be an unforgettable experience. Travel and accommodation may be more expensive that usual, though.